David Springett has made lace bobbins for close to 25 years. He specialised in turning highly decorated bobbins traditionally used in the East Midland area of England. He has developed a variety of tricks and techniques evolving an efficient method of working which made him one of the country's leading bobbin makers. 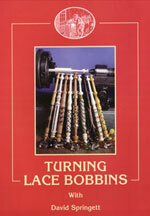 In this book David describes how to make over 24 different styles of lace bobbins explaining the techniques required to turn in both wood and bone. As well as describing the production of bobbins such as "Cow and Calf", "Bees Knees", "Caterpillar" and "Mother and Babe", he explains how to select and prepare bone, how to turn miniature bobbins, inlay pewter, produce Tunbridge Mosaic and make dowel using a simple jig. Many of these techniques are invaluable in other forms of turnery making this book packed with valuable tips and information. .David Springett's techniques, ideas and methods are an inspiration." 120 pages. Two leading woodturners, Nick Agar and David Springett, have collaborated to develop a new and exciting approach to woodturning. Using thin, narrow planks of wood, that are usually of little use to woodturners, they have produced extraordinary hollow, twisted vessels, wall plaques and sculptures. Their highly original turning method is described here in detail and there are 14 modern, dynamic designs to make, complete with comprehensive step-by-step instructions and illustrations. Nick Agar's revolutionary decorative methods are also fully explored, showing how the pieces can be finished with artistic flair. * Thorough guidance on tools and materials. * Highly creative and novel colour, form, decoration and turning. * Insight into how ideas can be developed. * 14 designs accompanied by fully illustrated step-by-step instructions. * A beautiful gallery of designs to inspire. Learn the secrets to a collection of puzzling projects, designed to mystify and intrigue. 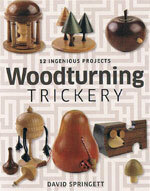 There are 12 seemingly impossible woodturned puzzles to make - all with incredibly simple solutions, once you know how. Using old techniques in a new and fascinating way, David Springett shows how to create these tactile and entertaining works of art. With clear step-by-step instructions, photographs and illustrations to follow, plus a wealth of information and guidance on tools, materials and techniques, you'll be mastering the tricks in no time. Spheres within spheres, stars within cubes, delicate lattices with no apparent means of support - woodturners over the centuries have developed a whole range of extraordinary structures which seem at first sight to be quite impossible. 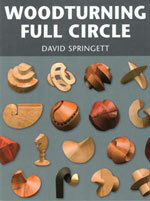 In fact, all these things can be made by anyone with basic woodturning skills, using an ordinary lathe and simple hand tools - and this book shows you how. A best-seller when first published in 1993, the book has been thoroughly revised for this new edition, with colour photography throughout. Stunning new 3-D illustrations show cutaway views of the work in progress, making the work in progress even easier to follow than before. 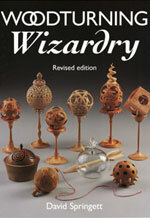 There is no magic in turnery which can be bought along with the most up-to-date machinery and tools, this book shows how to work with basic tools, how to make and use simple workshop made wooden chucks, and how to think around a problem in order to produce these pieces of "turned trickery". 190 pages. Try something new and different from the range of inspiring projects and ideas in this fascinating book. Turn "square" holes, fit marble runs into work, produce turned pieces which have only one side and one edge, turn boxes whose differently shaped lids are interchangeable. David will show how to turn these apparently complex pieces using simple tools, methods and techniques. The aim of this book is not to provide completed projects which can be followed and reproduced (although it certainly does this), but to stimulate and encourage experiment. These shapes do not come to an end on the last page of this book; there are still numerous variations of these shapes that are waiting to be discovered. Learn all those tricks of the bobbin making trade. 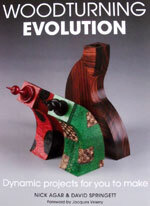 Turning bone and wood, "Mother and Babes", "Bees Knees", "Fairings", "Inlaid" and plenty more. The programme finishes with a section on decorating bobbins. Packed with ideas and techniques. 2hrs 24 mins.